There is something special about 100. Possibly it's because I come from a household where cricket is an important sport - or maybe not - but it was hard to pass up a challenge with 100 in it. 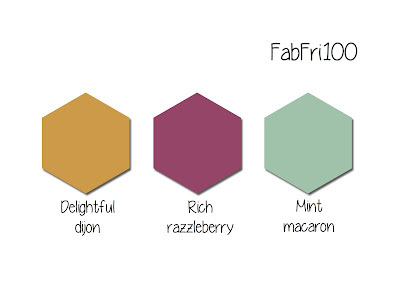 Added to that, the fact that the colour challenge at Fab Friday is absolutely gorgeous made this challenge irresistible! I've teamed this up with the sketch from Freshly Made Sketches, because I liked that too. This colour combination was recently used at another challenge. Nice for me that it's appeared again, as I had two ideas the first time round. It's been very satisfying to have a reason to develop the second. The dragonfly has a vellum underwing that I've coloured Delightful Dijon and then applied Wink of Stella to the front side, although that is quite hard to see in the photo. I added the gold metallic shapes, instead of the rhinestones that I'd originally planned, because they picked up the Delightful Dijon better. Further update: Happy to be in the Fab Four at Fab Friday. What a pretty card! I do love that dragonfly! Love that sponged band you've created! Beautiful! Thanks for joining us this week at Freshly Made Sketches! 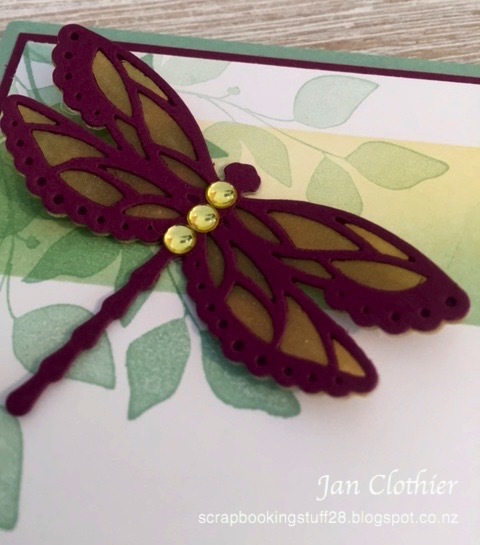 Another wonderful card - the dragonfly looks like it's hovering on the lovely subtle background. So very pretty - love that dragonfly! I love the sponged background stripe too - perfect! Thanks so much for playing at Fab Friday! So pretty! 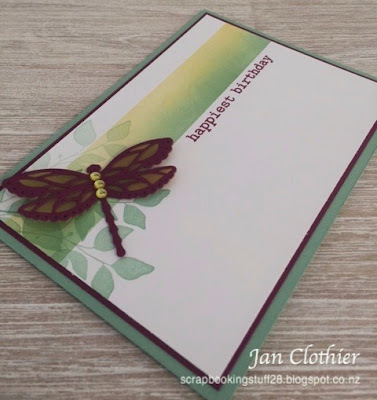 I love the soft stamping of the leaves over the sponged area and your dragonfly is perfect! Great design! Thanks for joining us at Fab Friday, hope to see you again soon! That dragonfly is wonderful! LOVE him on the branch with the softly sponged strip. Thank you for playing along with us at Freshly Made Sketches. How lovely! The way you did the sponging really softens these bold colors and gives them a whole new look! The dragonfly is gorgeous and the gold enamel circles are the perfect accent! Thanks for sharing at Fab Friday! Oh my gosh, Jan, this card is STUNNIING! 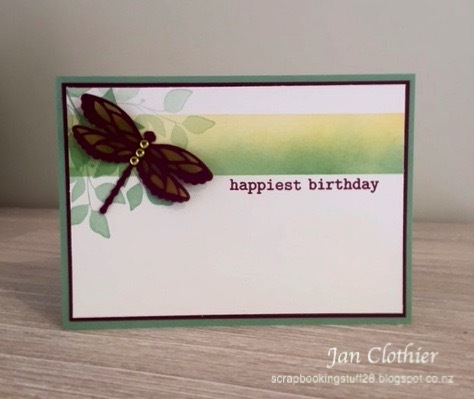 Love the background stamping and sponging perfection. Thanks for sharing with us at Freshly Made Sketches! Absolutely gorgeous! I love the vellum underlay on that dragonfly! Plus the soft colors and the subtle leafy print make this one elegant card! Thanks for playing along with us at Freshly Made Sketches! Wow, Jan! What a gorgeous card! The colorful vellum wings are a brilliant idea, I've never seen anything like that before! I will have to try that at some point. Thanks so much for the inspiration! Stunning card. Love, love, love that dragonfly.